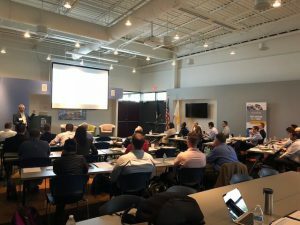 The 1st Annual APiS North America IQ-Software User Conference was held at Automation Alley in Troy, Michigan on June 4-5, 2018. Over 30 participants, representing 16 companies from throughout North America, were hosted. The invited speakers represented various companies including ZF, Daimler Trucks, Veoneer, Autoliv VNBS, Lear, Luminous Group, Takata, and APiS North America. The participants, and speakers, engaged in great discussions and networking for a dynamic outcome of knowledge and experience. The feedback received was very positive and included numerous voicings of looking forward to next year’s event, scheduled for June 3 and 4, 2019. 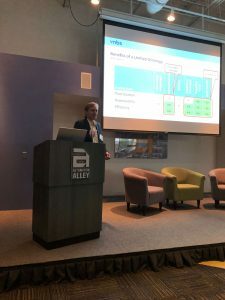 Participants commented that they felt a renewed sense of purpose with their respective company roles as they heard the presentations and joined the community of APiS North America IQ-Software users. Both speakers and fellow participants added new perspectives, ideas, utilization of features, and updated information. Engaged the audience with techniques to tailor the customer FMEA presentation experience for presenters and their customers, using the IQ-Software. Provided ‘hot-off-the-press’ information and insight about the AIAG/VDA FMEA Guidelines and fielded questions regarding what may occur (and why) as the merger discussions continue. Gave the attendees a perspective of Systems Engineering data “Ontologies” for data/knowledge sharing including the Metamodel for flowing from SysML architectures through to the APIS IQ-Software data model. Discussed her role as the global DFMEA coordinator to architect global teams and global IQ data structures with CARM Server Modules to ensure teams manage the FMEAs created and ensure project completion. Gave a popular topic an in-depth review of the various ways to connect DFMEAs and PFMEAs as design and process teams work together for the most robust outcomes. Reviewed the most current and known updates to the APIS IQ-Software as Version 7.0 is prepared for introduction in Q1-2018. 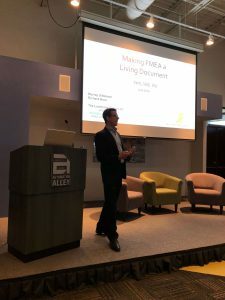 Gave meaning to the often used, but poorly understood phrase “The Living Document” by demonstrating how value and outcomes are achieved by managing the FMEA actions within Revision States. Discussed how FMEA facilitators & moderators are utilized within his business unit of ZF to maximize efficiency and efficacy of the global FMEA program. Discussed his engineering co-op experience to develop and incorporate his skills into his company’s FMEA program. Presented the features of the new (soon to be released) APIS IQN Reader software which allows stand-alone viewing of the IQ *.fme files. Offered the final hour of the conference for some expert Tips & Tricks and open Q&A about how to perform various tasks using the IQ-Software. Our networking event, following the first day, offered an excellent networking and relaxing evening together. Everyone enjoyed the downtime, food, and conversation as we spent a few hours getting to know each other and discuss the day and upcoming open session topic requests. To see a collection of photos taken at the two day event, please see the picture gallery. We would like to warmly thank the speakers and participants and we look forward to next year’s User Meeting which will be held on June 3rd-4th 2019.